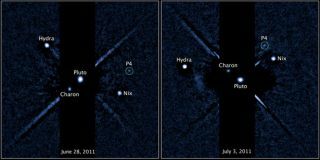 Two labeled images of the Pluto system, released on July 20, 2011, taken by the Hubble Space Telescope's Wide Field Camera 3 ultraviolet visible instrument with newly discovered fourth moon P4 circled. The image on the left was taken on June 28, 2011. The image of the right was taken on July 3, 2011. A fourth moon orbiting the dwarf planet Pluto has just been discovered. The tiny satellite — it's a mere 8 to 21 miles (13 to 34 km) across — showed up as a faint dot on new, long-exposure photos of the Pluto system taken by NASA's Hubble Telescope. But enough with the technical details: What will we call the newest member of the solar community? "It's called P4 for the time being," said Trent Perrotto, public affairs officer at NASA headquarters. "It'll get a name, but it's not up to NASA to decide on it." As usual with newly discovered astronomical objects, he explained, P4's name will be subject to a tough selection process overseen by an organization called the International Astronomical Union. In an unofficial Facebook poll of SPACE.com readers, the top choice is "Mickey." Unfortunately for them, though, this won't satisfy the IAU's official naming conventions. According to the IAU guidelines, "Objects crossing or approaching the orbit of Neptune … notably [Pluto and its moons], are given mythological names associated with the underworld." In choosing a name along these hellish lines for P4, the IAU nomenclature committee will try to honor the wishes of its discoverer: planetary astronomer Mark Showalter of the SETI Institute in California. What's his choice? "This is a topic under discussion," Showalter told Life's Little Mysteries. "We have a lot of colorful names to choose from because all the moon names come from, essentially, the minions of Hades [the Greeks' name for Pluto]. One name that seems to come up most is Cerberus, the dog who guards the gates to hell." Three-headed Cerberus is Hydra's sibling. "Cerberus: How could you go wrong with a name like that?" Showalter said. "But, unfortunately, Cerberus is already the name of an asteroid. The IAU balks at the idea of using asteroid names, although it's not necessarily out of the question. Even then, Kerberos, [the spelling that] is closer to the original Greek, would be OK even if Cerberus is not. I don't want to say that's the name we've chosen. There are a lot of interesting names being discussed." Showalter has been perusing the Internet today (July 20), looking for ideas. He and his discovery team will submit their top choices to the IAU soon, and he thinks they'll choose a name within two months. Perhaps Cerberus/Kerberos will soon be guarding the Kuiper Belt. This story was provided by Life'sLittleMysteries, sister site to SPACE.com. Follow Natalie Wolchover on Twitter @nattyover.Follow Life's Little Mysteries on Twitter @llmysteries, then join us onFacebook.